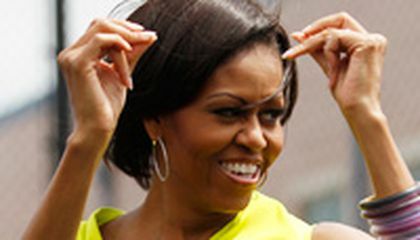 The first lady skips rope. She does abdominal crunches with a weighted ball. She jumps on and off a bench. It's all part of a White House video released as part of the fifth anniversary celebration of her "Let's Move" initiative against childhood obesity. She also chest presses 35-pound dumbbells and kick-boxes with a heavy bag in the brief video. It was recorded in the gym in the Eisenhower Executive Office Building. That is next door to the White House. She blasted the video out on her Twitter feed. I think it's good that Mrs. Obama is doing this for our children. She is going out there and doing these exercises herself to show how easy it is to do and that anybody can do it. She is really helping a lot of young people out there that are having diet problems. The fact that a women in such high power is taking her time and money and making videos for people that need it is just outstanding. I also think that it's good that she is asking the people to tell her what they need help on. She is using social media to get information on what people wont to be in the videos. I think that these videos will really help a lot of people. Instead of just sitting down and talking about what happened you could get up, start walking you could lose some calories, and get some sunshine. Take in some fresh air and take out all your stress. This is a good idea! I think I'm going to do it when i go home and get on twitter. The advantage of "walking meetings" is so that you can have a meeting and talk about some important things while also doing important things like exercise. Have you ever wondered what the first lady, Michelle Obama, does to have you and her stay active. Well if so, let me tell you. Just a couple of days ago she released a video at the White House, of her jump roping, chest pressing 35 pound dumbbells, doing sit-ups with a weight ball, box jumps, and kick boxing. All of this is for her campaign against child obesity. She also posted the video on her Twitter account and asked everybody what they do to stay healthy? She also has been working on her "GimmeFive" challenge with celebrities. Some people on Twitter asked her what her five favorite workouts and workout songs are. Mr. Obama, our president, also got involved with all these campaigns. There is a video of him and Joe Biden, our VP, running up stairs. I think its really cool that the first lady and president are helping all kids get fit. I would like to watch the videos they posted. In this article it tells about Mrs Michelle Obamas work out techniques and how to get healthy really fast. She does multiple work outs and shows people how she does them. She also tells her diet and tells people how to get healthy really fast and how to get on a good diet. This article was pretty interesting. I think for some this is a good way to get people up and active. For so many she can be a great inspiration and will help fight childhood obesity big time. I think that it is great that she is challenging kids to stay healthy and active, most kids today don't because of electronics. She does a lot of exercises for someone her age and most kids don't do anything near that much. I think that more kids should be more active. I think that it is cool that there are so many wys to stay active and that she is putting "GimmeFive" challenge. The reason The "GimmeFive" is a good idea is because people need to start exercising more because they will be more healthy and that is why t is a good idea for the "GimmeFive" challenge. I think it is a good way to exercise, since it is an entertaining way to exercise, you can also is accompanied by your friends or boyfriend. Exercising with a friend or a group of people can help make this activity more fun, interesting, and you can motivate a person to continue with a regular exercise routine.